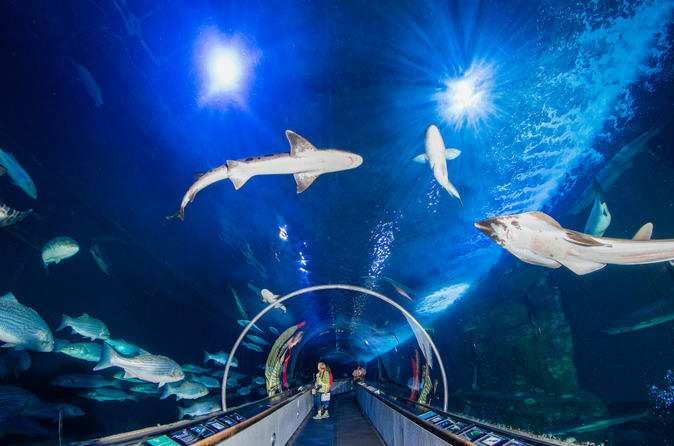 Visit Aquarium of the Bay for an interactive introduction to the fish and other marine life that live in San Francisco Bay and its surrounding Pacific waters. This general admission ticket includes access to the Aquarium’s main exhibit areas, which feature more than 20,000 animals. You can observe creatures like sharks, rays, sea stars and river otters. With its location at the foot of PIER 39 between Fisherman’s Wharf and the Alcatraz ferry landing, Aquarium of the Bay is easy to fit into your San Francisco sightseeing schedule. When you arrive at Aquarium of the Bay, located on San Francisco’s bustling Embarcadero (also home to other attractions like Fisherman’s Wharf, the Pier 39 sea lions, Boudin Bakery and the ferries to Alcatraz Island), head inside with your general admission ticket and begin your self-guided exploration of the aquarium. Special Offer - Price displayed includes a 27% discount off the local admission price! We'll get you in the door for cheaper. Save when you book with us. - Book Now!